The 400 block of West Baltimore Street was the location of the first toll booth of the National Road. The block, across from the Hippodrome Theater, is a mostly intact street wall of historic properties and includes two of the last nine full cast iron fronted buildings still standing in Baltimore (see entry below for cast iron buildings). Most of the buildings on both sides of the block are protected to some extent under city ordinance and are listed as “contributing buildings to be preserved” under a written memorandum of understanding between the city and the Maryland Historical Trust. After plans that called for the demolition of much of the south side of the block were abandoned in 2009, the block has seen significant rehabilitation of its historic structures. On the north side, the anchor corner building has been renovated, and many of the buildings on the south side that were proposed for demolition have now been restored by owners A&R Development Corporation and David S. Brown Enterprises. 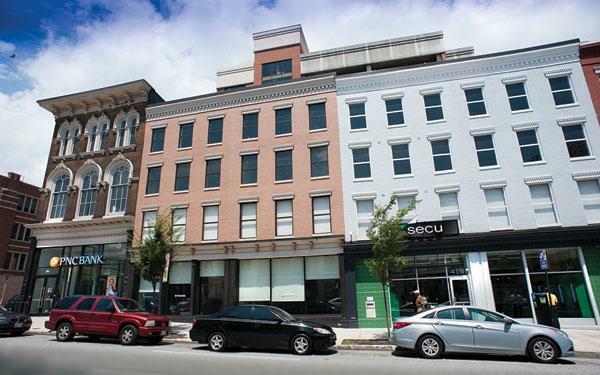 Baltimore Heritage removed the block from the Historic Preservation Watch List in July 2010 in recognition of the substantial rehabilitation and renovation that has signaled a commitment to retain the historic buildings in this important part of the west side of downtown.